The fourth season of Red Dwarf is interesting in that it is the only one without any major format changes. Some of the behind-the-scenes changes were quite big, most notably the moving of production from Manchester to the far superior Shepperton Studios near London, but otherwise the status quo from Season 3 remains unchanged. The season begins with Camille, starting a brief two-year tradition resulting from the season beginning on Valentine's Day. In this episode Kryten recovers a female mechanoid named Camille from a wreck, but once back on Red Dwarf it's clear things aren't as they appear, as Rimmer sees Camille as a hologram and Lister sees a human woman. As for the Cat...I'll let that remain a surprise, as it's a classic Red Dwarf moment. It's quite a funny episode based around Casablanca, featuring some ripe misquoting of dialogue and some corny lines, but at the heart of it is some very interesting character development for Kryten, putting him back more or less where he was at the end of his first episode in Season 2, which was probably overdue. The second episode, DNA, continues the theme of basing an episode around a major SF concept. In this episode the crew discovers a machine that can alter DNA and transform any biological entity into any other one. The upshot of this is that Kryten (whose brain is based on organic technology) gets transformed into a human. Cue some rather Star Trek: The Next Generation Data-esque musings on the nature of humanity and some rather more traditional Red Dwarf musings on how Kryten can cope with his new human sexual organs. This plot thread, though amusing, is thankfully cut short by a far funnier sequence where Lister ill-advisedly runs his mutton vindaloo through the DNA machine, resulting in the creation of a ravaging curry monster. In Justice a long-standing plot hole is addressed: we learned in Season 1 that Rimmer was (albeit inadvertently) responsible for the accident that wiped out the crew of the Red Dwarf, but this was never really developed. This episode makes up for it when the crew visit an abandoned space prison only for the controlling AI to determine that Rimmer must stand trial for his crime, leading to a classic sequence where Kryten has to prove that Rimmer is innocent by virtue of being an incompetent, deranged and self-delusional half-wit ("If I have full access to your personal date files, I could perhaps put together a winning case by maybe lunchtime,"). This is another very solid episode, notable in the Red Dwarf mythos for introducing the simulants, a human-built race of psychopathic mass-murdering androids who return to plague our crew in future seasons. Dimension Jump is one of the series' bona fide classics, introducing a parallel universe where Arnold 'Ace' Rimmer is a test pilot in the Space Corps Special Service, the best of the best, and is entrusted with piloting a faster-than-reality starship across dimensions. Arriving in 'our' reality he makes contact with the crew of Red Dwarf and is rather taken aback when he discovers that 'our' Arnold Rimmer is a rather different character. This is a great episode because is gets back to scouring Rimmer's backstory and psyche to find out what makes him tick, and it works well with Chris Barrier delivering a barnstorming performance as a super-handsome, heroic incarnation of Rimmer (complete with a Top Gun-esque soundtrack and a rather bizarre catchphrase). Meltdown is another one of the series' unsung high points. Kryten constructs a matter-transmission device which teleports the crew to a planet thousands of light-years away. However, the planet turns out to be a 'Waxworld' where the wax-droid inhabitants have broken their programming and have divided into two factions fighting an endless war. Cue some brilliant scenes where Rimmer takes command of the 'hero' army and puts the likes of Mahatma Gandhi ("Don't eyeball me, Gandhi! Drop to the floor and give me fifty! "), Pythagoras, Jean-Paul Satre and Stan Laurel through advanced combat training with the help of Kryten and his second-in-command, Sergeant Elvis Presley. Meanwhile, Lister and Cat are captured by Adolf Hitler and forced to witness the (thankfully offscreen) execution of Winnie the Pooh by a firing squad led by Al Capone, before being tortured by Emperor Caligula and Rasputin! Events culminate in an impressive (and ludicrous) battle sequence between the forces of good and evil, with a rather unexpected outcome. A completely barking mad and brilliant episode with some of the show's most enduring quotes. The fourth season of Red Dwarf doesn't rock the boat and happily continues the formulae from the third season, and as it's a formulae that works, this is not a problem. The characters of Kryten and Rimmer are explored in greater depth, but Lister drops into the background slightly more, becoming more of an observer and the viewers' surrogate stand-in for exposition scenes. The Cat has some great lines and scenes but isn't really focused on much. Holly gets her own episode, but there is already a notable reduction in her lines going on, as again much of the show's exposition goes to Kryten. These problems will become more apparent and will be addressed in the fifth and sixth seasons, but for now remain under control. 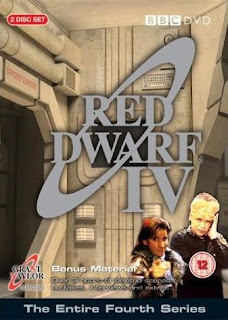 Season IV of Red Dwarf (*****) is available now on DVD in the UK and USA.